Which water bodies are covered under blue economy? What is Sustainable Blue Economy? A Sustainable Blue Economy is a marine-based economy that provides social and economic benefits for current and future generations. It restores, protects and maintains the diversity, productivity and resilience of marine ecosystems, and is based on clean technologies, renewable energy, and circular material flows. What is the global Oceans worth? Globally, the ocean economy has an asset base of over USD 24 trillion and generates at least USD 2.5 trillion each year from the combination of fishing and aquaculture, shipping, tourism, and other marine based activities. Why Sustainable Blue Economy Conference? The conference is an opportunity to establish and build upon achievements gained to date in the area of the Sustainable Blue Economy, and to provide concrete examples of how it can help contribute to the well-being of people and nature across the world. How do we ensure people and nature benefit from the blue Economy ? Business as usual is not an option to secure ocean health. The Blue Economy is expanding rapidly. Following a "business as usual" trajectory, one that neglects the impacts on marine ecosystems, will be catastrophic for the Ocean, the Blue Economy, people and the planet. The Blue Economy concept should be focused on sustainability rather than simply being a blue growth agenda. This foundational approach cuts across all aspects: from sustainable fisheries to coastal communities, resilient habitats, plastic free oceans, coral reef rescue, the nurseries initiative, and eliminating bycatch of critical marine species. What do we need to achieve a Sustainable Blue Economy? We urgently need a set of guidelines and ‘guardrails’, through governance and strong frameworks, to influence investment decisions, development policies and programmes within the maritime sector along the most sustainable pathways possible. More urgency and emphasis on sustainable approaches to securing the Sustainable Blue Economy are needed. We invest in communities and governments to take a precautionary approach to the immense economic opportunities provided by the coastal and marine ecosystems. We are working closely with government, local communities, the private sector and other development partners to promote best practices and tools that are helping secure the natural capital for the benefit of people and nature. Such tools include: application of strategic environmental assessments, spatial planning, integrated ocean management, community based management of natural resources and strengthening legal and policy frameworks. We have also helped in putting value to the Ocean assets. In partnership with Boston Consulting Group (BCG), we have produced key reports including: The Global Ocean Economy Report, which puts the value of acean assets at USD 24 trillion and The Western Indian Ocean Economy Report which is estimated at USD333.8 billion. We are working in collaboration with the Prince of Wales's International Sustainability Unit, the European Commission and the European Investment Bank , on Sustainable Blue Economy Finance Principles. Voluntary sustainable Blue Economy Finance Principles to act as a framework for investment and development policy decisions. Sustainable Blue Economy Principles to inform policy decisions and development programs. These Sustainable Blue Economy princieloped by WWF are designed to support the Sustainable Development Goals (SDGs), in particular Goal 14 (“Conserve and sustainably use the oceans, seas and marine resources for sustainable development”). Call for strengthened partnerships between communities, governments and/or non-state actors to deliver nearshore and offshore fisheries conservation with greater urgency. Call upon governments, development partners, the private sector and local communities to commit themselves to redouble their efforts to protect, restore and secure the resilience of ocean ecosystems, biodiversity and dependent coastal communities. Urge governments in partnership with other key players to create a legally binding agreement to eliminate the leakage of plastics into the ocean. 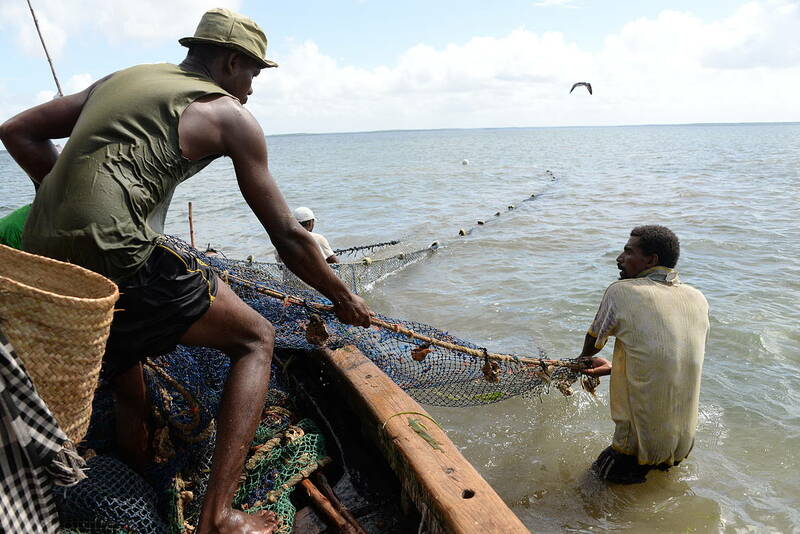 The sustainable fisheries management encourages fisherman to adopt sustainable fishing methods that enhance the fisheries resources in the area. Photos and graphics © WWF or used with permission. Text available under a Creative Commons licence.